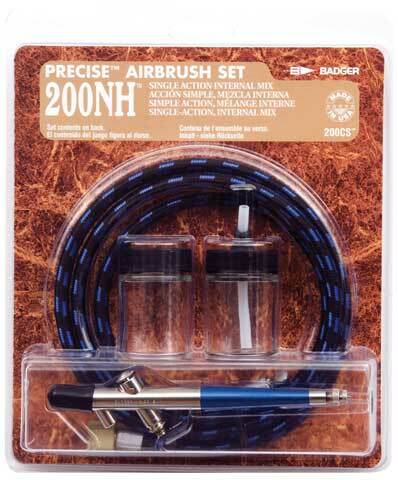 This set features an airbrush that offers the ease of single action operation while providing the fine spray pattern of internal mix paint atomization for professional results. Depressing the trigger releases a pre-set amount of color, which can be regulated by turning a needle adjustment screw at the back of the airbrush handle. Once the desired paint flow is set the airbrush will maintain the preset spray pattern until the user chooses to change it. The self-lubricating PTFE needle bearing enables continuous proper paint flow and prevents needle wear and the PTFE head seal assures efficient air flow. Great for the advanced model painter or decorative stenciler, and it also works well for painting posters, auto detailing and ceramics. It will spray inks, dyes, watercolors, gouaches, properly reduced acrylic, fabric paints, modeling paints, automotive lacquers and enamels, most ceramic stains and glazes and more. The set also includes two empty bottles and an air hose.